Fruit may be grown on an arbor. If you're searching for a free garden arbor plan, there are so many available it's going to make your head spin. From simple and functional to elegant and eye-catching, there's a free garden arbor plan that will suit your garden available online. Garden arbors are also known as trellises or pergolas, depending on the style and complexity. Trellises can also be freestanding or lean against a wall. A true garden arbor is three-sided, with two walls and a roof of some sort overhead. They can be made from many substances such as wood, metal, or even PVC pipe. Garden arbors serve both functional and decorative purposes. Functional purposes: Garden arbors provide space for vines to grow, offering support and places for vine tendrils to cling. They also provide shady spots in the garden for visitors to sit, rest, and enjoy the vista. Decorative purposes: Garden arbors can become strong focal points in the garden. A focal point is any object in the garden, natural or manmade, that draws the gaze towards it. Think of a big specimen tree, a climbing rose on a wrought iron obelisk, an urn or a statue. These are all types of focal points. A garden arch or arbor set at the end of a pathway also acts as a focal point, a destination to draw people into the garden. Most vines can be grown on garden arbors. For arbors arching over benches or seats, a pretty vine such as wisteria, jasmine, morning glory or another flowering vine offers shade and sweetly scented blossoms. Garden arbors can also be used for vegetables that grow on vines. Hops, various beans, and even squash can be grown on garden arbors. These look especially striking in kitchen gardens, those gardens that feature a mixture of herbs, vegetables and flowers. There are many sources of free plans for garden arbors online. You can also try your local public library. Many offer how-to and do-it-yourself types of books among the gardening selection. Check to see if these books include plans or blueprints. Online, the following sources offer many free plans. They vary in complexity, difficulty and cost. When choosing among all the plans available, think about both your skills and how much you want to spend. 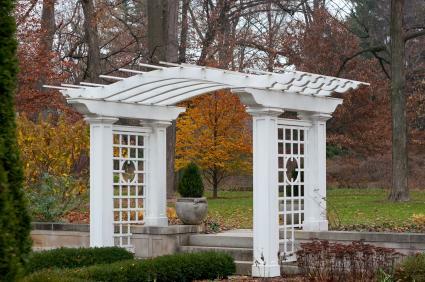 It may also be helpful to compare the cost of building a garden arbor with the cost of purchasing a ready-made arbor. Bluegrass Gardens offers over a dozen free arbor plans. Build a rose garden arbor, a vegetable garden arbor, a simple arbor, and many more. Each plan comes with a detailed drawing and schematic as well as a list of materials that you'll need. Just print off your plan, take it to your local hardware or home and garden center, and figure out how much it will cost. Then get building! Woodworkers Workshop offers not only the plans to build an arbor, but tip sheets too. You can craft a cedar arbor, a romantic arbor and more. There are even plans to make connecting trellises to add a very special touch to your garden arbor project. Garden Plans offers a plan to build an arbor in a weekend, along with other fun garden plans. If you love to enhance your garden with features you build yourself, this is one site worth exploring. Garden Structure also offers plans for cozy arbors. You must purchase some of the plans. Whether you're looking to build an arbor in a weekend or take your time, there's enough variety to choose from so that you're sure to find the perfect garden arbor for your landscape.